I just made a quick update to the FDTracer plugin for FlashDevelop. This fix resolves an issue with FlashDevelop beta 4 and selecting FDTracer’s “Settings…” option from the plugin’s context menu. Along with the revisions to the FD Settings Manager in beta 4 came a couple of API changes so you should only use this version of the plugin with beta 4 (or greater). If you’re still using beta 3 I’d say it’s a good time to update both. I’ve just installed FD3 Beta5 and tried using FDTracer 0.3.2. After configuring the log file location from FD3, I still could not get any trace outputs in FDTracer. I guess you’re certain the debug Flash Player is installed and configured (maybe you installed the brand new 9.0.115 player too)? If you open the log file in notepad is it being updated? I’ll poke around a bit more to see if anything needs to be updated for B5 compatibility. Yup it was a fresh installation so I grabbed all the latest, which includes the 9.0.115 debug Flash Player. ;) The log is being updated. The thing that I noticed is that when the swf is running in FlashDevelop, no traces was found. But if I test the swf in Firefox 2.0.0.11 with FlashTracer installed, the output gets to BOTH FlashTracer and FDTracer. Is this an AS2 project? If so, can you check the value of Project > Properties… > Compiler Options > Trace Mode. Try setting it to “FlashMX” and see if it helps. hmm.. it’s an AS3 project actually. Will that affect? FlashDevelop uses the Flex debugger (FDB) with AS3 apps so the Trace Mode won’t even be a project option. Typically you should be getting Trace content in the Output pane – without need for FDTracer. Copyright (c) 2004-2006 Adobe, Inc. All rights reserved. 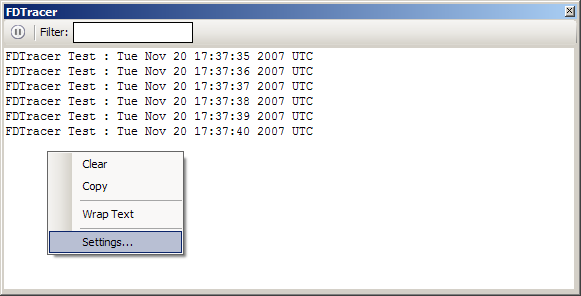 Set breakpoints and then type ‘continue’ to resume the session. I’ve tested the FDTracerTest file that you attached and the Player seems not able to connect. So sorry to trouble you with this, and I just want to thank you for the help you have rendered. Failed to connect; session timed out. 2. you are running the Debugger version of the Flash Player. No worries flashmech. I’ve had a few bad Flash Player scenarios around the office lately and have taken to doing a complete uninstall (adobe have a handy uninstall app on the support site) and then fresh re-installs. Meaning to say that I have to uninstall the players and install them back again to see if it manages to connect? I would give that a shot and see if it helps. It sounds like you have a good install of the debug player plugin in Firefox but maybe the ActiveX player is borked. (FlashDevelop uses the ActiveX of the Flash Player when you do a ‘Test Movie’). So THAT’s the key! I have no idea that FlashDevelop uses the ActiveX version of the Flash Player to debug! My ActiveX player was a regular, not the debug version. That must be why it couldn’t connect. andrew, plz help. I have same problems like flashmech. I uninstalled and re-installed but probs are still here. Note the “isDebugger” line. If it says false you don’t have the ActiveX Flash Debug player installed. Unable to cast object of type ‘PluginCore.TextEvent’ to type ‘PluginCore.DataEvent’. Certainly Master, it sure cheers me up, thanks a lot.